I am up to the sleeves on the persille jumper, and I am knitting both at once. I have completed the increases, and now I just need to keep knitting until I reach the desired length. Then it’s a few rows of binding off, then its on to some sewing up, so I can knit the neckband. I am not a big fan of sewing up, and I tend to put it off, sometimes for weeks. One of Squeak’s cardigans was almost too small when I finally completed it, so I try to finish as soon as possible so Squeak doesn’t miss out. I decided I had to finish Squeak’s Feathers shawl/blanket. 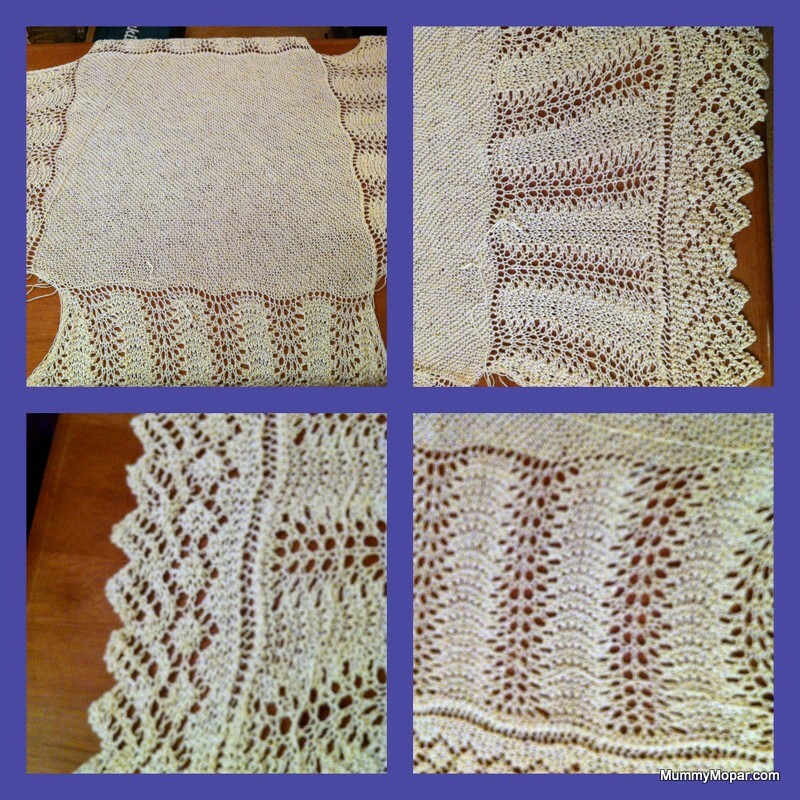 Squeak loved her Bubbles blanket, which is a round feather and fan shawl, knitted in 4 ply cotton. I picked up the pattern book at an op shop a few years ago, and knitted it on a whim before Squeak was born. When my Mum first met Squeak, she was swaddled in her Bubbles blanket, and Mum told me she had one like it as a bub, it was lent from a friend and she was so happy Squeak had one similar. Once Squeak grew out of being swaddled in the blanket and started sleeping in her cot, I started searching for a square version of the pattern. I found this one in patons knitting book 216. I knitted it in Heirloom Organic cotton 4 ply. I just have to sew it up, I am getting very excited!! It was harder to knit than the feathers. It was knitted as a diamond, increasing then decreasing stitches. Once the centre is finished, the loops on the edge are picked up, and knitted out in a wedge. It was more challenging than my normal knit, but I was up for the challenge. I am hoping to have it finished soon, I am hoping to have an evening to sew up the corner seams, I want to get it right, so I don’t want to rush it.